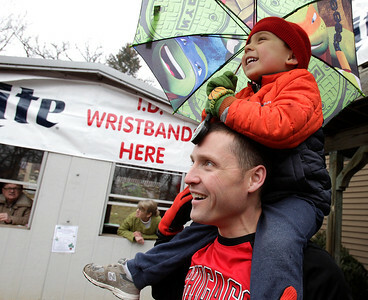 Matthew Apgar - mapgar@shawmedia.com Eric Boeche of Arlington Heights holds his son Charlie, 4, atop his shoulders as they watch ski jumpers soar through the air during the annual Norge Winter Ski Jump Tournament on Sunday, Jan. 31, 2016 at Norge Ski Club in Fox River Grove. 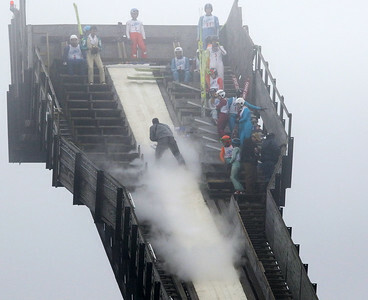 Matthew Apgar - mapgar@shawmedia.com Ski jumpers look on as liquid nitrogen is poured onto the top of the track prior to competitions in the annual Norge Winter Ski Jump Tournament on Sunday, Jan. 31, 2016 at Norge Ski Club in Fox River Grove. 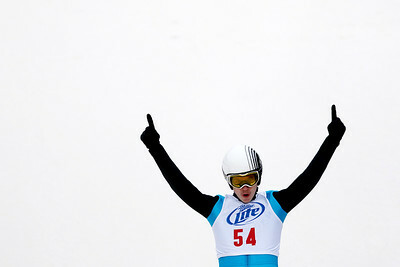 Matthew Apgar - mapgar@shawmedia.com Niko Loytainen celebrates his landing during the annual Norge Winter Ski Jump Tournament on Sunday, Jan. 31, 2016 at Norge Ski Club in Fox River Grove. 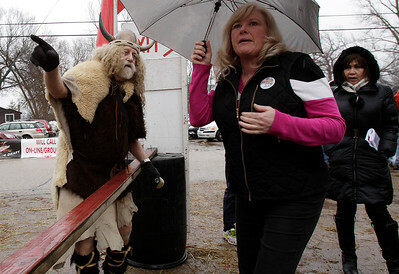 Matthew Apgar - mapgar@shawmedia.com Dressed like a viking, Marty Knapp of Fox River Grove gives directions to people near the entrance to the annual Norge Winter Ski Jump Tournament on Sunday, Jan. 31, 2016 at Norge Ski Club in Fox River Grove. Matthew Apgar - mapgar@shawmedia.com Spectators cheer as Matic Benedik glides downhill during the annual Norge Winter Ski Jump Tournament on Sunday, Jan. 31, 2016 at Norge Ski Club in Fox River Grove. 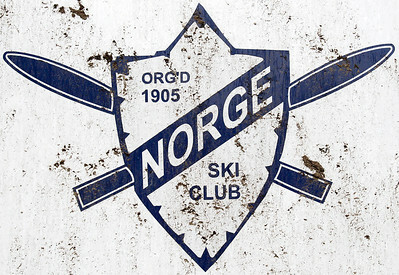 Matthew Apgar - mapgar@shawmedia.com A mud-caked sign marks the entrance to the annual Norge Winter Ski Jump Tournament on Sunday, Jan. 31, 2016 at Norge Ski Club in Fox River Grove. 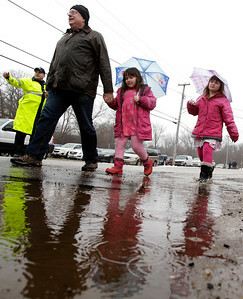 Matthew Apgar - mapgar@shawmedia.com John Wirtz of Barrington Hills navigates the mud and puddles as he walks with daughters Charlotte, 5, center, and Jane, 6, to the annual Norge Winter Ski Jump Tournament on Sunday, Jan. 31, 2016 at Norge Ski Club in Fox River Grove. 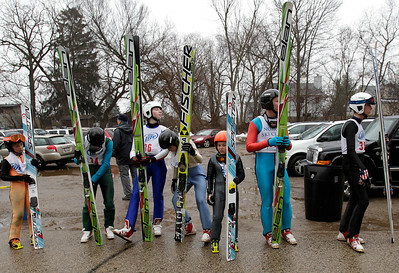 Matthew Apgar - mapgar@shawmedia.com Ski jumpers await a shuttle to the jump for the annual Norge Winter Ski Jump Tournament on Sunday, Jan. 31, 2016 at Norge Ski Club in Fox River Grove. 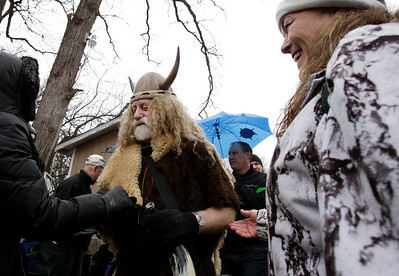 Matthew Apgar - mapgar@shawmedia.com Dressed like a viking, Marty Knapp of Fox River Grove, center, gets mobbed near the entrance by people hoping to have their photos taken with him during the annual Norge Winter Ski Jump Tournament on Sunday, Jan. 31, 2016 at Norge Ski Club in Fox River Grove. 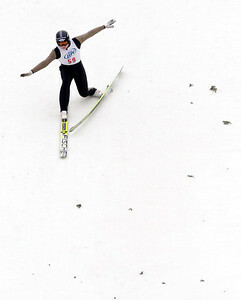 Matthew Apgar - mapgar@shawmedia.com Mats Soehagen Berggaard loses a ski on his landing during the annual Norge Winter Ski Jump Tournament on Sunday, Jan. 31, 2016 at Norge Ski Club in Fox River Grove. 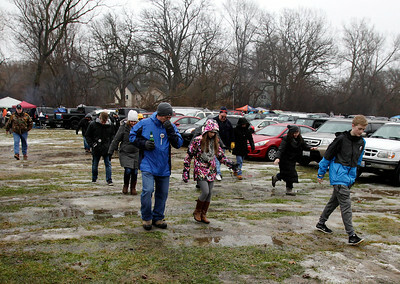 Matthew Apgar - mapgar@shawmedia.com Spectators navigate the wet and muddy parking area as they make their way to the annual Norge Winter Ski Jump Tournament on Sunday, Jan. 31, 2016 at Norge Ski Club in Fox River Grove. 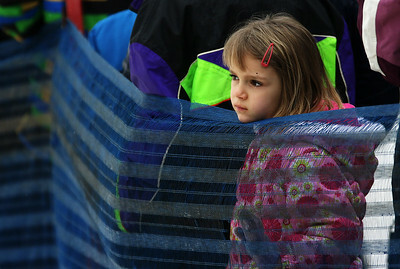 Matthew Apgar - mapgar@shawmedia.com A young spectator watches ski jumpers compete during the annual Norge Winter Ski Jump Tournament on Sunday, Jan. 31, 2016 at Norge Ski Club in Fox River Grove. 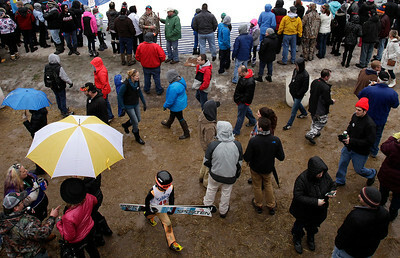 Matthew Apgar - mapgar@shawmedia.com Lauren Kersting of Wauconda, left, tries to stay dry under her umbrella as she and Sue Busse of McHenry make their way to the annual Norge Winter Ski Jump Tournament on Sunday, Jan. 31, 2016 at Norge Ski Club in Fox River Grove. 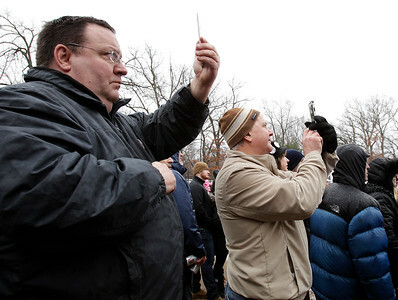 Matthew Apgar - mapgar@shawmedia.com Matt Merritt of Chicago, left, and Peter Pizzolato of Arlington Heights, center, hold their smartphones up to record video of ski jumpers during the annual Norge Winter Ski Jump Tournament on Sunday, Jan. 31, 2016 at Norge Ski Club in Fox River Grove. 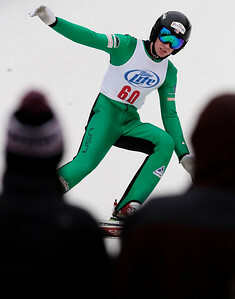 Matthew Apgar - mapgar@shawmedia.com Trevor Edlund puts the brakes on after landing his jump during the annual Norge Winter Ski Jump Tournament on Sunday, Jan. 31, 2016 at Norge Ski Club in Fox River Grove. 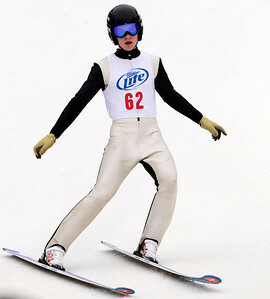 Matthew Apgar - mapgar@shawmedia.com Casey Larson puts the brakes on after landing his jump during the annual Norge Winter Ski Jump Tournament on Sunday, Jan. 31, 2016 at Norge Ski Club in Fox River Grove. 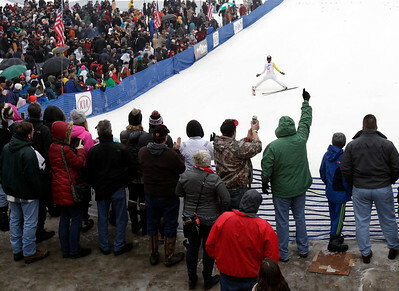 Matthew Apgar - mapgar@shawmedia.com Thousands braved the wet, foggy conditions on Sunday to attend the annual Norge Winter Ski Jump Tournament on Sunday, Jan. 31, 2016 at Norge Ski Club in Fox River Grove. 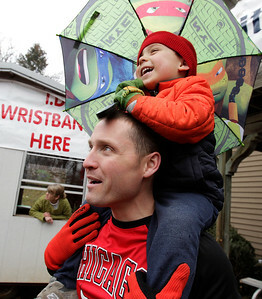 Eric Boeche of Arlington Heights holds his son Charlie, 4, atop his shoulders as they watch ski jumpers soar through the air during the annual Norge Winter Ski Jump Tournament on Sunday, Jan. 31, 2016 at Norge Ski Club in Fox River Grove.